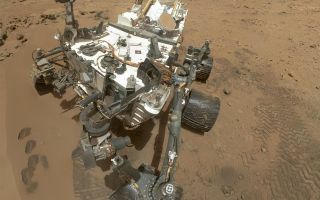 On Sol 84 (Oct. 31, 2012), NASA's Curiosity rover used the Mars Hand Lens Imager (MAHLI) to capture this set of 55 high-resolution images, which were stitched together to create this full-color self-portrait. On Sol 84 (Oct. 31, 2012), NASA's Curiosity rover used the Mars Hand Lens Imager (MAHLI) to capture this set of 55 high-resolution images, which were stitched together to create this full-color self-portrait as seen in this space wallpaper. The mosaic shows the rover at "Rocknest," the spot in Gale Crater where the mission's first scoop sampling took place. Four scoop scars can be seen in the regolith in front of the rover. The base of Gale Crater's 3-mile-high (5-kilometer) sedimentary mountain, Mount Sharp, rises on the right side of the frame. Mountains in the background to the left are the northern wall of Gale Crater. The Martian landscape appears inverted within the round, reflective ChemCam instrument at the top of the rover's mast.